You’ve spent the last few weeks in full on interview mode, spending hours preparing, learning and time spent at interviews, but thankfully it’s all paid off and you’ve received the perfect offer from the firm you’ve been desperate to join from the start of the process. With sweaty palms and a frog in your throat you decide that now is the time to confront your current employer and let them know you are leaving them for ‘Dream Company XYZ’. For roughly 50% of people this is the end of the road, they diligently work their notice period and join their new company, living happily ever after… at least that’s the plan. HOWEVER, the other 50% of notice givers soon find themselves in an altogether more complicated scenario, as their current employers try their utmost to keep them in their team. At RealRec we have observed a significant change in the recruitment market over the past few years. Our clients are eagerly looking to employ top talent, however, the number of viable candidates is at an all-time low (this is due to a number of reasons, but mainly people weren’t given the opportunity to join at a graduate level during the last recession and as such there is now a severe shortage of candidates with 4-7 years experience), leading to a massively candidate short market. What this means is that good candidates are being fought over like an injured gazelle at a watering hole. 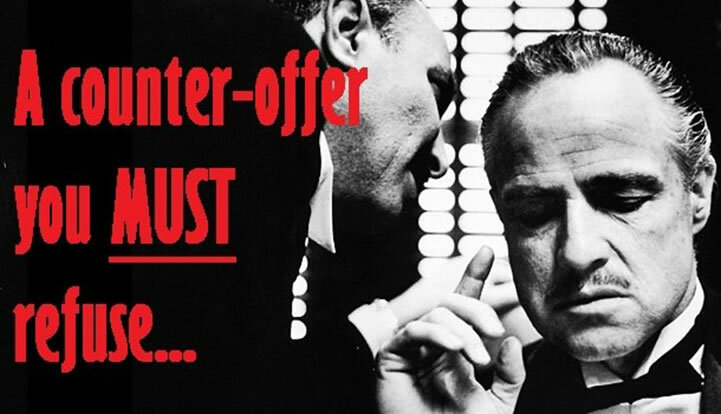 When backed into a corner your employer is only left with one ‘Last Gasp’ or ‘Hell Mary’ option and that is to give you a counter offer you can’t refuse! So don’t be surprised when you are offered a significant improvement on both your current salary or even your new offer. We have regularly encountered salary increases of 15%+. I am sure your boss will do their grovelling best to re-assure that things will be different and whilst this might seem flattering, PLEASE DON’T BE FOOLED!!! Research indicates that 50-60% of people who accept their counter offer will leave within the following 6 months, 80% within a year. There is the chance that you will be that 1 person out of 5 where a counter offer leads to better things, however, it is highly likely that accepting and staying put is the wrong decision… not to mention the constant thoughts of “what if I had just joined Dream Company XYZ”. Good luck with facing this extremely tough situation!